A selection of the contents. Acidic salts of heteropolyacids as solid acid catalysts for liquid-phase organic reactions (Y. Izumi, K. Urabe). Methanol-based synthetic reactions over solid-base catalysts (W. Ueda et al.). Direct amination of lower alkenes with ammonia over zeolite catalysts (N. Mizuno et al.). Acidic clay-directed polymerization-cyclization of aldehydes and pyrrole to porphyrins (M. Onaka et al.). NMR studies concerning the acidity and catalysis in zeolites (D. Freude et al.). Extra-framework sites in H-Al MFI and H-Ga MFI zeolite catalysts (S.M. Bradley et al.). Elementary steps of acid-base catalyzed reactions in molecular sieves (J.A. Lercher et al.). Interaction of NH3 with O2 at the surface of MgO (G. Martra et al.). Synthesis and catalytic properties of sulfate ion-promoted Zr-pillared clays (M. Katoh et al.). The role of sulphate in the stabilisation of zirconia (C.J. Norman et al.). Controlled pore opening of VIP-5 by partial removal of water molecules (S. Prasad et al.). Preparation and catalytic properties of composite zirconium phosponates (K. Segawa et al.). Prominent change in reaction characteristics of high silica zeolite induced by isomorphous substitution with transition metals (T. Inui, K. Matsuba). Aromatization of short chain alkanes on Ga MFI catalysts (M. Guisnet, D. Lukyanov). Shape selective alkylation of aromatics on metallosilicates (T. Yashima et al.). Photocatalytic oxidation of ethanol over tantalum oxide supported on silica (T. Tanaka et al.). The role of support in methane reforming with CO2 over rhodium catalysts (J. Nakamura et al.). Butene dimerization over sulfate and tungstate modified solid acids (S. Soled et al.). Key word Index. Solid acid catalysts are already being used in various processes in petroleum refining and are presently being studied intensively in both academic and applied fields for usage in a variety of reactions. Solid base catalysts are also gaining increasing recognition as potential catalysts. Both acidic and basic catalysts are promising not only with respect to acid and base-catalyzed reactions but also in materials sciences, such as the production of adsorbents, sensors, ceramics, etc. The present volume presents the text of 21 invited oral presentations and 58 poster presentations. 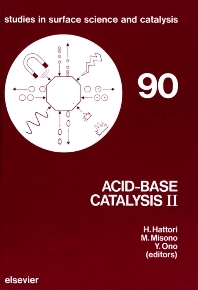 The material covers a wide range of aspects on acid-base catalysis, from quantum chemistry to industrialized processes.